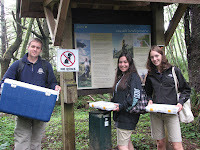 Woodland Park Zoo Blog: Zoo Corps and Silverspot butterflies - a winning combo! Zoo Corps and Silverspot butterflies - a winning combo! 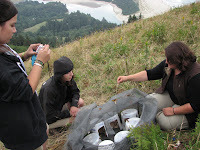 On Thursday, August 13, Brenna and Claire, two of our Zoo Corps teen interns got the great opportunity to have a direct impact on wildlife conservation by participating in the release of endangered Oregon silverspot butterflies at a protected site in Cascade Head Reserve, Oregon. The site, run by the Oregon Fish and Wildlife Department and The Nature Conservancy is not only protecting some of the last vestiges of this rare native butterfly, it also is the site of what is becoming an ever dwindling habitat, coastal grasslands. The zoo has been participating in the Oregon Silverspot Butterfly Recovery Project by raising butterfly at the zoo and releasing pupae back to this location which also hosts the butterflies' favorite food, the early blue violet. We asked Brenna and Claire to write about their field experience. This type of hands-on conservation has really inspired them! Since I have been hearing about the silverspot project since 5th grade (when my class attempted to grow violets), this trip really brought out what this is all about. It’s exciting and it’s a great feeling seeing the butterflies flying that were raised in our labs and we picked so many leaves for them. I’ve felt really proud to work with a conservation project throughout the summer and I was pleased to actually be able to see them in the wild as opposed to just caterpillars in a lab (not that I don’t enjoy the caterpillars, either). I’m pleased that the whole day was agreeable (the weather, the views, the people we traveled with, etc., etc.) The silverspots looked awesome. It was incredible to see the vast diversity between them all when they all looked quite similar as larvae. I would love to have this experience again. I think that going on this silverspot trip has allowed me to appreciate the work I have done at WPZ more. All of the dishes and violet leaves and pupae papers have made this experience come true. I am very thankful to have this opportunity. Every little action helps this butterfly species live. I thoroughly enjoyed working on this conservation effort, and I am proud to be making a difference. I enjoyed the weather, and the type of work we did at the release site. I wish I could’ve seen more of the Portland zoo, but I liked seeing their butterfly/larvae lab.